A 18 minute video showing you exactly how to use the tools with ease. SEO Manifesto. This is a 12 minute audio rant about how easy search engine optimization is and how you can slap the search engines back! A 55 page PDF with the 20 tools and explanations of how to use them properly. 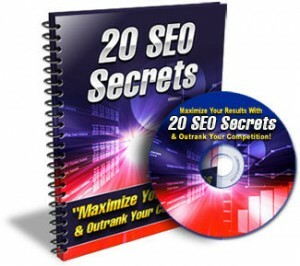 The 20th tool is a 30 page list of resources that will make your seo a breeze. We will also throw in a copy of Ross’s SEO Diamond Ebook to make sure you understand everything you need to know about SEO!